I'm sure you have all heard the warnings about dogs overheating during the summer months. I agree that this is something that can't be stressed enough. Leaving a dog in a hot car is a life threatening situation. I wanted to remind pet owners that other types of pets can overheat too. Often called "exotic pets" or "pocket pets", there are many small animals that can very easily overheat. The inspiration for this post comes from a couple of different places. First, the guinea pigs over at Hutch a Good Life wrote about something similar on their blog regarding guinea pigs and heat exhaustion. Also, my passion for exotic pets and their health and care is very high. I'm sure many of you have already noticed that though. Lastly, during my working interview at the emergency animal hospital the subject of overheated guinea pigs came up. One technician asked "Why would anyone take their guinea pig outside anyways?". I tried to explain that it's actually good for them to go outside and many guinea pig owners have hutches for their pets to enjoy the outdoors in. In general, most small mammals are very sensitive to temperature whether it be cold or hot. I think that rabbits and guinea pigs are the two main types of pets people like to take outside for some fresh air every now and then. This is great exercise for them and is encouraged. When I had a ferret many years ago, he had an outdoor cage as well as his indoor one. He also went out on his harness and leash sometimes. Here's a list of tips you can follow to make sure your small exotic pets keep cool during the summer months! 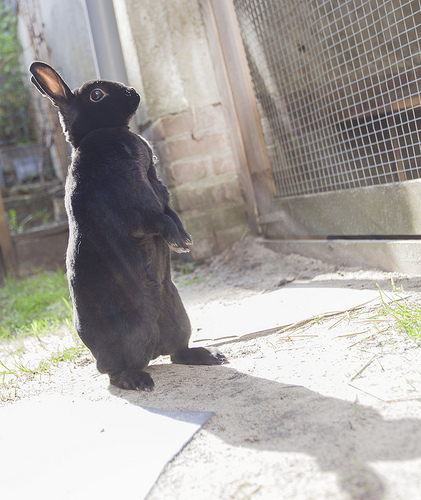 Don't place your pet's cage or enclosure in direct sunlight. If your pet is outdoors, make sure they aren't kept out in the heat for too long and always provide an area of shade for them. Don't let your small pet walk on hot concrete. 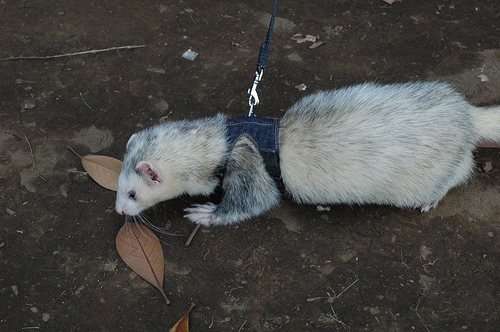 Some small pets, such as ferrets, will actually walk on harnesses. Don't allow your small pet to walk on very hot surfaces! Also, try to place their outdoor playpen or hutch in an area where it's grassy or cool. Go swimming for peas! This tip may only apply to rats. 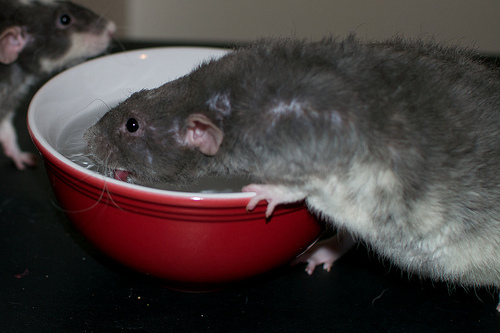 One thing I do for my own rat is fill a bowl or pan up with cool water and add a couple of peas to it. Is there anything a rat doesn't love more than peas? Your rat should go swimming and diving for the peas, cooling them off in the process. Place a frozen water bottle in their cage. Freeze a water bottle and wrap it in some sort of fabric. Place it in your pet's cage. This should help cool things down in there. And your pet can lay next to it if they are feeling warm. Use a fan. This can be especially helpful if you don't have air conditioning in your home. Placing a fan in front of your small pet's enclosure can help with the heat. Provide a cool surface to lay on. Surfaces like tile tend to stay cooler than bedding materials. Just like dogs like to lay on tile surfaces to stay cool, small animals may enjoy the same thing. You can even place these surfaces in the freezer so that they'll be even cooler for your pet to lay on. Always provide fresh water! Of course, always make sure your little friends have plenty of nice fresh clean water to stay hydrated. Remember - small pets overheat too! If you suspect your small pet may be overheating, you should seek veterinary medical attention quickly. These types of animals are extremely sensitive and will require quick medical attention when they overheat. Heat exhaustion can be fatal, unfortunately. Do you have any tips to add to this list? I'd love to hear them! We all need to be vigilant while it is so hot. Have a fabulous Friday and stay cool. Excellent point. I love reading about the special treats the zoo animals get in the summer. Like giant ice cubes with embedded fruits and vegetables. Thanks for this important post. Specially rabbits in outdoor cages have to bear under this heat. mostly they have bitumen felt on the top - that's not a good idea. I'm still amazed that people leave their pets and CHILDREN in a boiling car. Then have the nerve to say "Oh boy it's hot in here". Yes - you're definitely right about that! And this is why my rabbit still has stitches. The vet is far away. I have a million things to do. At which of these things am I allowed to bring in a cat carrier with a rabbit inside? I'm heading out today to get his stitches removed, then bringing him straight home. Ugh. Yea I'm sure that's a pain, but at least you're being responsible and not leaving him in the car! Yay! I bet you could totally get some fancy looking purse carrier thing and carry him around in that hehe. That is some good advice. I guess cats could be considered small animals too. Mine that live outside do stay in the shade. Those were some great suggestions. Take care. The heat is bad for all of us. I feel for the animals that can't get relief from it. Aw that's so nice of you Bren! Those wild rabbits are pretty smart and know what they're doing ;) I guess they have their ways to stay cool. shiner...we haz hurd that ADDIN ice cubes ta water bowlz iz KNOT a good thing ta due coz it can dropz de blood pressure oh de pet two quik lee....yur mom mite noe if this bee troo ore knot..... ? I think it's OK to add some ice cubes to the water dish every now and then. When an animal is suffering heat exhaustion, it is not good to cool them down too quickly. You shouldn't put them in ice cold water for those reasons. Those were all great tips and the little ones need extra attention fur sure! Great advice! I heard on the news here a week ago that a lady lost her dog because she left it in the car while shopping. I will never understand why people are not more careful with their pets. Just not worth the risk, whatever size our furry friends are! Some people are honestly just not educated... I actually wrote an article on Examiner about that lady earlier today. Speedy is a smart boy :) I know some rabbits may not be as lucky as him and go outside in pens where they could be forgotten about or left out in the sun. I think many birds are probably better adapted to the heat. I've never really met a bird that had problems with overheating. Mostly we just had to worry about them getting too cold. That's pretty hot. It's about the same here too. We have the same problems with people and dogs too. Great suggestions. Love the one about diving for peas...lol.